the bubble lady Archives | What Should We Do Today? Please visit What Should We Do This Weekend? for MLK Jr. Weekend 2019 by clicking here! We’re heading into a 3-day weekend for many people and there are several ways to celebrate the legacy of Martin Luther King Jr. throughout the weekend! Here are 16 things you can do with your kids in and around Columbus! Enjoy! This 1-act adaptation of Snow White includes audience participation and is recommended for ages 3 and up! The Sean Carney Band is featured at your choice of two jazz concerts (10:00 AM and 11:30 AM) and each child receives a PBJ sandwich, juice and a cookie! Cost is $5 per person with a family max of $20. Watch the movie Frozen on the big screen at COSI! This annual hockey face-off between the Columbus Police Department and the Columbus Fire Department raises money to support first responders in Columbus and throughout Ohio! Your ticket includes 2 hockey games (including OSU), a performance by the Columbus Police & Fire Pipes & Drums, an interactive emergency vehicle display, the opportunity to see K9 and horse mounted patrol and more! Tickets available online! 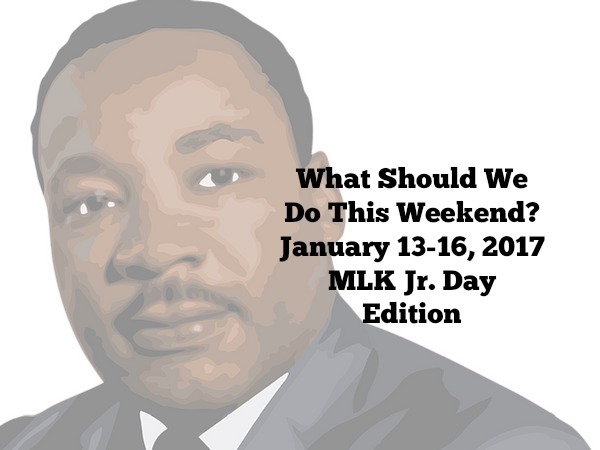 Kids age 3-11 are invited to this event to celebrate the life and legacy of Martin Luther King Jr. There will be stories, a craft and more! There is a LEGO challenge and theme that will be revealed at the program! Kids can join together in teams or complete the building challenge individually! This concert is geared toward children and the story of Peter and the Wolf is told through different instruments! Arrive early (2:00 PM) for crafts, instruments to see and play, musical tattoos and more! Children are encouraged to dress as their favorite animal! All ages are welcome at this family day skate! If you arrive before 11:30 AM your admission is only $.99! Check out the special hours of open play at SuperGames! Availability is limited to the first 150 children so arrive early! The Columbus Zoo and Aquarium is offering free admission on MLK Jr. Day! Parking is $10 per car. A special price of $5/hour per kid is being offered Monday only at Brick of Dreams! This special Ready for Kindergarten Storytime celebrates Dr. Martin Luther King Jr. with a special story and activities! Appropriate for ages 3-6 years. Worthington’s community celebration will include speaker Reginald Dwayne Betts and performances by Capriccio adult and youth choirs! See The Bubble Lady blow amazing bubble creations! This free community event is open to adults and children to experience musical and live theater performances, learn about the civil rights movement, see an art exhibition and do art activities! The Annual City of Columbus Rev. Dr. Martin Luther King, Jr. march takes place on Monday at 4:00 PM and will feature a program with Keynote Speaker Bishop Vashti Murphy McKenzie. RSVP online! Families are invited to celebrate the birthday of Martin Luther King Jr. with a read aloud, craft and literacy activity! There will be refreshments served.